As the busy mom of four children, I’ve been lucky to be able to spend time with some of my best friends and rejuvenate my spirit. 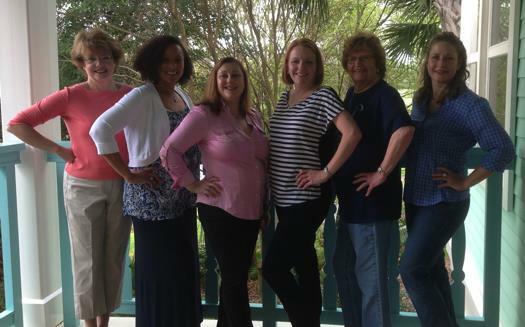 Over the years, I’ve joined some of my high school friends and my sisters for girls’ weekends. The fact that I live in New Hampshire and can get away to sunny Florida during the frigid winter is a real bonus. Historically, we’ve met at the beach and enjoyed walking, laughing and eating delectable food. There are usually some yummy beverages involved as well. 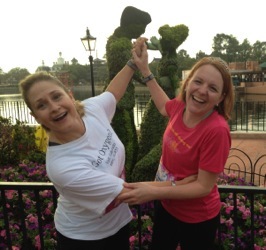 In 2012, my friend Charlene and I discussed participating in a runDisney 5K instead of meeting at the beach. 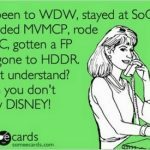 We certainly knew that we could get in better shape, but the fact that we could run through a part of Walt Disney World Resort made it even more enticing. 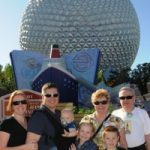 Charlene and I have spent a great deal of time with our husbands and then our children at Walt Disney World Resort through the years. 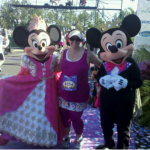 Several of us started the Couch-to-5K program to prepare for the 2013 Disney Royal Family 5K. We’d update one another through texts and tried to motivate each other. It was great to have a support system. Although I don’t really consider myself a runner, I did my best and improved my time. I was motivated because I was going to be attending my first 5K and I wanted to be ready. 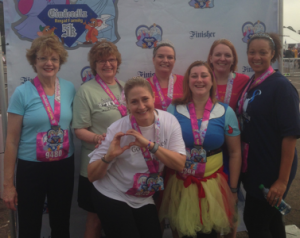 A group of us met at Walt Disney World Resort in February 2013 to attend the 5K and have our girls’ weekend. Although it wasn’t my best time, I completed my first 5K! 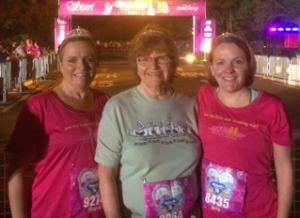 Having had such a good experience in 2013, we decided to sign up for the 2014 Cinderella Royal Family 5K. I was able to convince my mom to come with me this time. I told her how impressed I was with the variation in ages the previous year. Although she wasn’t a runner, she was taking walks in her neighborhood almost daily. She was concerned about the being able to maintain the 16-minute per mile pace that runDisney recommends. I tried to reassure her that I didn’t think it would be a problem as she really walked at a decent pace. It’s just an opinion, but based on what I saw, I think that runDisney allows more time for the 5K than the half marathon or the 10K. 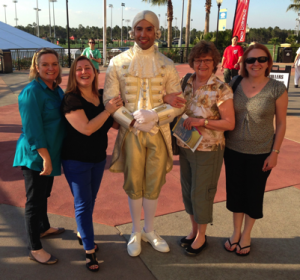 In February, I traveled to meet my mom where she lives North Florida and we drove down to Orlando together. We met Charlene and my sister at ESPN Wide World of Sports Complex. When we arrived, they greeted us with a glass of sparkling wine and cupcakes to start the festivities. Let girls’ weekend begin! When we entered the Expo area, there was a wall with all of the participants of the events for the weekend. This was really a nice touch. It was fun to find our names amongst the sea of runners. We headed to pick up our race numbers, packets and shirts. This was really easy and there was no wait. After that, we explored the exhibitors’ booths where there was a plethora of running accessories. I was so impressed at how many women seemed to have businesses centered on running. I bought my mom some bling for her running shoes and a shirt for myself that said, “are my kids still chasing me?” There was so much to see and we could certainly have spent more time and money but decided to head to our resort. Disney’s Old Key West Resort was perfect for our group. Charlene is a DVC member and had reserved a Grand Villa. Two more of my high school friends and a mutual friend joined us at the villa to get the party going. We decided to cook pasta and eat in so we could relax. We knew we would have to be up early so we didn’t stay up very late but were able to enjoy each other’s company for a little while. That 4:30 a.m. wake-up call came very quickly. We were all up with our tiaras on and ready at the bus stop at about 5:00 a.m. If you’re interested in attending a runDisney event, I really recommend staying on property, as the traffic going into the race area gets very congested. We just hopped on the bus and bypassed the cars trying to get into Epcot’s parking lot. A really fun thing about runDisney races is the costumes that you see. People are so creative and it always makes me wish that I were able to sew. As we were waiting for the race to start, we had lots of time to admire the various portrayals of characters. Loud music blared and that really pumped us up, which was necessary since it was so early. We were in the last corral. Although I could have put myself in an earlier corral based on my time, the point of this experience wasn’t to beat my own record. It was to be present in this adventure with people that I cared about. I stayed in back with my mom, my friend who’s had two hip surgeries and our mutual friend. It wasn’t about making it to the finish line in record time; it was about starting the journey in the first place. We enjoyed chatting (and dancing) our way around Epcot’s World Showcase. There are stops along the way where you can have photos taken with different characters but the lines tend to be long, especially if you are in a later corral. We just really enjoyed ourselves. It was more fun than work. The four of us ran across that finish line together arm-in-arm. No, we weren’t the fastest or even close to the front. Maybe we didn’t go a huge distance compared to many that weekend. From someone on the outside looking in, it may not have seemed like much. But, for us, it was an accomplishment. I was beside a grandmother of 15 grandchildren who was afraid she’d be swept from the race, a woman who’s body had betrayed her far too young, and a woman who’d just completed her first 5K. They were all winners to me! After finishing, we met up to head back to Old Key West Resort. There was only a short wait for the bus. We showered and drove to Downtown Disney for a celebratory lunch. Going to Bongos is a tradition of ours so we went there and had some great food, beverages, and lots of laughs. For some, the weekend might continue with other races. For us, we were done with racing and just had fabulous, quality time together. This included a spa day, some retail therapy, and more delicious cuisine. We even made it out to Jellyrolls on Saturday night where we sang along to some silly songs and laughed… a lot. We came together that weekend, united in love and friendship. We left feeling refreshed. We’d like to do this again sometime in the future. Unfortunately, the 2015 Disney Princess 5K sold out very quickly this year so we weren’t able to register for the upcoming race. 2015 may not be the year, but my personal goal is to participate in a 10K at some point. My mom has also had major health issues in the last two months so I look forward to eventually walking across another runDisney finish line with her. I’m hoping that this dream becomes a reality and am thankful that runDisney can give me the opportunity to make a wish come true. One thing is certain; we will continue to have fun together! Kelly is a former Floridian who now lives in New Hampshire with her amazing husband, creative daughter and three busy sons. They have many happy memories of Walt Disney World Resort.